I know how easy it is to be soo excited that when you finally get to your vacation destination you don't look around. 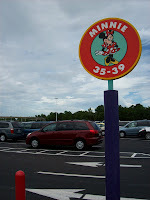 We arrived at the Disney Parks each day, unloaded the stroller, cooler, backpack, tickets, camera, and the kids. We raced to the entrance to get through the gates as soon as we could so we could race to the most popular ride to be sure we had a chance to enjoy it in a timely manner! Somewhere along the line we forgot to look around us! We forgot to pay attention to not only where we parked, but the people around us, the smells, the sounds, and view in amazement at what we had before us. In actuality if we had stopped we would have been trampled, but we are going to have to remember to do that...next time??? On our last day in Disney we went to Hollywood Studios. We stayed until it was dark. We left after Fantasmic, which is a fantastic show that features lights, fireworks, real characters, water, and sound. The day was fabulous and everyone was in good spirits, but exhausted. We walked out of the park and were rushed forward with the crowd. We hurried along until suddenly it dawned on us that we weren't sure we knew where we were going or where we parked! Was it Mickey, Minnie, Goofie, Pluto? Disney does a nice job of labeling each lot and marking each row with a number, but after 5 days of parks we couldn't remember which character we had left our car with that day! So note to Disney: Mark the lots with different characters at each park! Don't repeat them! I know they have different words under them, but really I'm not going to remember if it was Imagination, Staging, or Active after a long day!! Give me a specific picture with a color to remember and hopefully by the end of a hot day, with three kids, spilled ice cream, a lost camera case, 30 minute lines for 3 minute rides, and a water/firework show I will remember where to walk in the dark with three exhausted children to find my car! My Mom must have looked particularly lost because a Cast Member actually asked her twice is she was ok! We were redirected to an entirely different area and direction and felt pretty confident. After walking around a few rows we did what every other person in the parking lot was doing that night and started pushing the car alarm! It was like a Disney show all over again! Those alarms were on surround sound accompanied by flashing lights and running figures! Yes, we did finally find my Dad with the car which was a rental so I think that made it even more difficult to find in the dark! (He looked in each alarm sounding car for his sweatshirt he left on the front seat so he probably looked like he was casing cars out to break into them!) 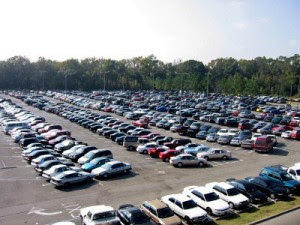 Don't make that your last adventure of a long day- maybe take a picture of your parking area with your digital camera or phone before you hurry off to that ride it may save you a lot of time, panic, and odd looks!